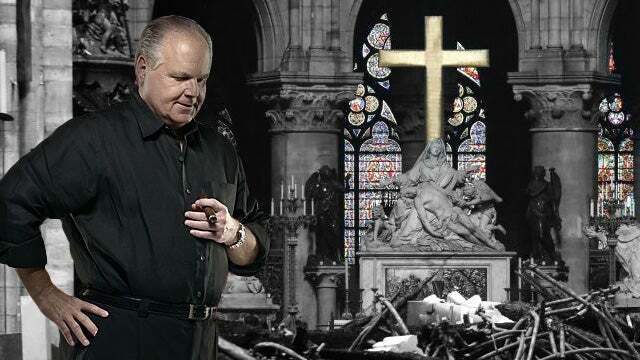 RUSH: So now the question of rebuilding it. We can rebuild it. Humanity can rebuild it. And I’m sure computer technology graphics will be used to try to replicate as much of the original structure as possible. If there’s a lesson to all this, the 1992 fire at Windsor Castle. I had forgotten about that until I read this. Windsor Castle is the queen’s favorite castle. She likes it better than Buckingham Castle. I mean, she likes to go to Balmoral in Scotland, get away from the city, but Windsor Castle is her favorite, I’m told. It’s one of the jewels of gothic cathedral architecture. And it was founded by William the Conqueror in the eleventh century. That’s gonna be a big deal, by the way. The technology available at the time of the original construction, the type of craftsmanship necessary is in short supply today because things have been modernized so much. He said, “The roof I’m assuming is oak and there’s plenty of oak available, including sessile oak which is long, straight-stemmed oak trees –” The problem’s gonna be will the environmentalist wackos let anybody go cut down the trees to rebuild the roof. RUSH: Here is Camille in Tallahassee. Great to have you on the program. Hi. CALLER: Hi. Thank you for taking my call. 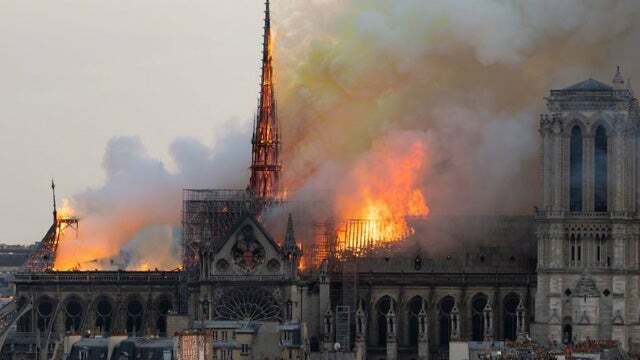 I was watching yesterday, as everybody else was, the burning of the cathedral in Paris, Notre Dame Cathedral. As a Catholic, I was very, very saddened to see that. But this morning, I was looking at the pictures of the aftermath. I don’t know. Did you see the picture of the cross? RUSH: I did. I did. And the stained glass. Some of the stained glass looks undamaged. It looks untouched. It’s amazing. But, yes, I saw the picture of the cross. RUSH: But white nationalism survives. Yes. RUSH: I think you have every right to feel that way. I think it’s a touching, symbolic realization. It hit me the same way that it hit you. I’m glad that you called, Camille. Thank you. RUSH: Here is John in Woodbury, New Jersey. You’re next. I’m glad that you waited. Hi. CALLER: Oh, Rush, can I bestow a title on to you? You’re a great disseminator. You can take these facts and these events and distill them and boil it down so lesser minds can understand it like mine. RUSH: Uh, well… Ahem. Yeah. We make the complex understandable here. RUSH: Thank you very much. CALLER: I have two questions I guess so to throw at you. One is I wonder how many of these construction workers in France are actually French construction workers. I wonder how many of them are unassimilated workers that they have imported because they don’t want to do it, who don’t give a darn about the project that they’re working on. How easy, stealthily it would be to create a terrorist act and blame it on an accident. RUSH: Wait a minute. What are you suggesting here? CALLER: Oh-ho-ho. (laughing) I’m sure you can understand what I’m saying, even though I may not be explaining it a hundred percent clearly. RUSH: Well, no. Are you talking about the eventual repair work, the French are not gonna be able to find enough natives and they’re gonna have to outsource it? CALLER: No. I’m talking about the reconstruction work. RUSH: Well, okay. The reconstruction work. They’re not gonna be able to find enough natives to do it, so gonna have to outsource it. In the process, you’re gonna be outsourcing to a bunch of terrorists, they’re gonna sabotage the rebuilding? Is that what you’re saying could happen? CALLER: It — it — it… Not the rebuilding. The actual construction that was going on that caused the fire. RUSH: Oh. Oh. Oh. Oh. Oh. Oh, yeah, yeah. Okay. Okay. RUSH: Well, I wouldn’t be so sure. (laughing) Maybe now. Maybe now with Trump having revitalized the trade union. Okay. I get the drift. I get the drift. The French have outsourced so much that how do we even know the credibility, honesty of the people who are working on the construction project? We just don’t know. I mean, that’s something that time will have to give us some indication of.